Hari Rai Temple is a beautiful shrine dedicated to Lord Vishnu at Chamba in Himachal Pradesh. 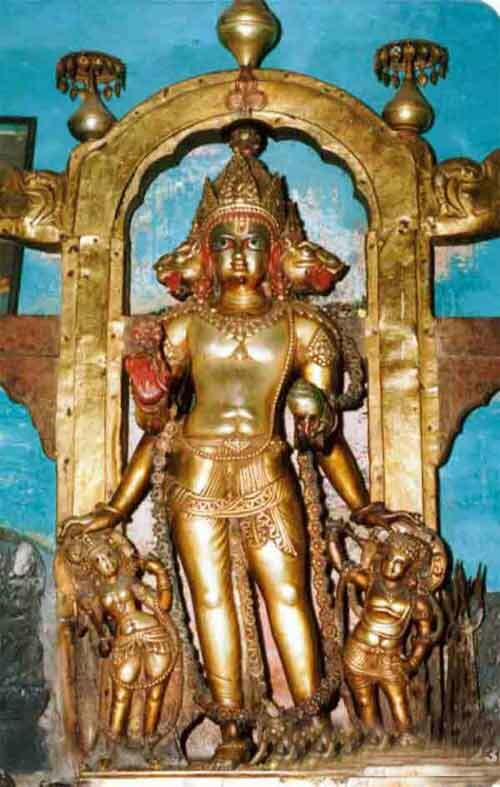 The murti (idol) of Vishnu worshipped in the temple is ethereal. It is a four-face murti of Vishnu. One head is that of Boar, another is that of a lion and the other two are human faces one calm and the other is frightening. On the front, the four-faced idol has an image of Lord Vishnu wearing a crown in the form of a lotus. There is the face of a lion on the right, that of a boar on the left and a face with a mustache on the back. The murti of Hari Rai is always clad in a dhoti; decorated with exquisitely beautiful jewelry, which includes diamond shape clasps, pendants, bracelets, rings, necklaces and a crown. The murti has bright silver eyes. The deity is flanked by two short figures one male and one female. Symbolically the female figure stands for moon, maya, fire, and mace. The male figure represents chakra, sky, and air. It is believed that the murti belongs to the 9th or 10th century AD. …is not only superb in execution and particularly remarkable for its naturalistic modeling and muscular treatment of the chest, but is in a perfect state of preservation with all details intact…full of vitality, yet refined and elegant. The murti stands on a pedestal, from which rises a Devi, her hands beneath his feet. Richly bejeweled and….draped with a sari, a scarf and a…blouse, she is looking up towards her lord in wonder. One of the most famous stories associated with Hari Rai Tempe is associated with the Ravi River and the Minjar Mela. The Ravi River used to flow along the temple and people could not reach the temple due to the fierce flow of the river. Only a sage could swim through the current and offer worship in the temple. Sahila Varman, the ruler of the region, requested the sage to make the temple accessible to all the people of the region. The sage went into deep meditation and while meditating he also wove a cord – the original minjar. The deep trance lasted for a week. On coming out of meditation, the sage threw the cord into the river upon which the Ravi River changed its course. The temple became accessible to all devotees. This divine is annually remembered during the Minjar Mela on the last Sunday in July. It is believed that the present temple was established during the 11th century AD. The ornate shrine is relatively small. It is a shikara temple made out of stone. The walls of the temple are peppered with carved motifs including that of Surya, Shiva and Goddess Parvati. Weighing around 240 kg, the bronze idol was stolen from the temple on the night of May 6-7 in 1971. Its disappearance had then sent shock waves among the residents. But thanks to the efforts of some detective agencies, the plot to smuggle the idol out of India was foiled. After a 45-day nationwide hunt, the agencies traced the idol to a godown at Mazagaon in Mumbai in June, 1971. The statue finally returned to Chamba, where it was reinstalled in the sanctum sanctorum of the temple during a grand function.